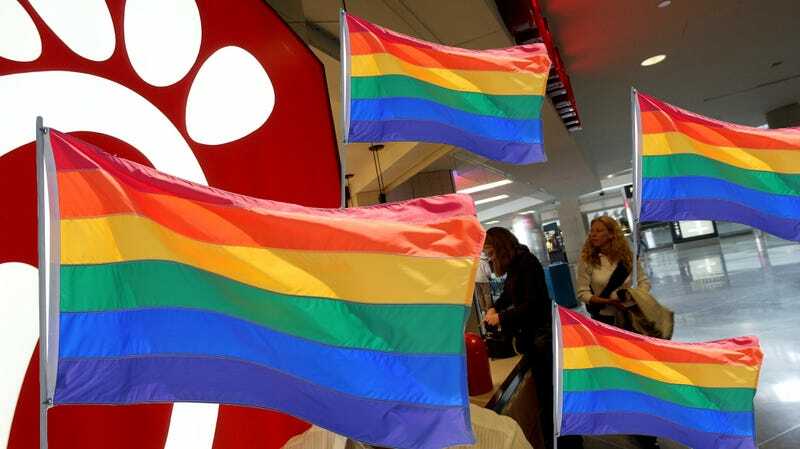 City council hopes to make San Jose airport Chick-fil-A “gayest” in U.S.
Just over a year ago, San Jose City Council and the city’s mayor, Sam Liccardo, approved plans for a new Chick-fil-A location inside San Jose International Airport. Two other cities—Buffalo and San Antonio—recently banned Chick-fil-A from their airports for the chicken chain CEO’s opposition to gay marriage, and San Jose is now having second thoughts about its own airport Chick-fil-A outpost, scheduled to open a month from now. Rather than kicking the restaurant out of the airport, San Jose City Council has a plan to just make that airport Chick-fil-A really, really gay. It’s a unique solution to the airport Chick-fil-A question, which will likely arise in other cities as the chain’s contracts come up for renewal. On a recent vacation, I found the Chick-fil-As in both the Dallas and Tampa airports busy both early in the morning and later in the day, though it would have been nice to see some rainbow flags brightening up the terminal nearby. Also, Gay-Fil-A has a pleasant rhyme to it.